After a long day, often the last thing you want to do is cook. As much as I love cooking, I am so aware of the time constraints everyone is under, especially during the holiday season. I definitely have evenings where I order in takeout or eat popcorn or cereal for dinner, but this shouldn’t be the norm! Trust me when I say that I know what it’s like to have a day where it feels like the life has been knocked out of you. I remember when I used to work 14-hour days on film sets regularly. I realized that was not how I wanted my life to be. While I do still put in long hours (especially between basically two jobs), it isn’t anything like those gruelling film days. Whether it’s stress from work, a fight with a friend, or just plain exhaustion, there are so many things that can make you feel #overit. That’s where quick dinner recipes come in. What’s the secret to a good one pan recipe? I’ve seen a lot of bad one pan recipes out there. They trick to making a delicious one pan meal is to make sure you’re using ingredients that all cook in the same amount of time. In this case, the carrots, Brussels sprouts and cauliflower all cook in the same amount of time. Chopping them to the right sizes also help, the cauliflower florets are chopped into bigger pieces and the carrots are cut into 1″ pieces and the Brussels sprouts are halved. Somedays, as tired as I might be, I know that cooking will make me feel better at the end of the day (that said, I never felt like cooking at the end of a 14-hour day). I feel like if you’re here, reading this blog, then maybe you fall into the same category? Do you find cooking to be somewhat therapeutic? One pan wonders are my favourite kind of quick dinner recipe. Toss everything together in one pan, throw it in the oven, and there is nothing left to worry about. You can pour yourself a glass of wine and turn on the TV and relax. Or open a good book, or read your favourite blog, or write your own blog, however you choose to unwind at the end of the day. Before you know it, dinner is ready. You could even be super proactive and meal prep this recipe on the weekend so that you have it ready to go during the week. If you don’t want to actually cook it on the weekend, you could chop all the vegetables and store them in the fridge until you’re ready to cook this fast dinner recipe. I feel like this is a really great option if you like to spend your weekends cooking for the week ahead. You could chop everything up on a Sunday and cook it on Wednesday! Pair this with: Bell pepper rice or summer quinoa salad. I just like to eat this as is for dinner, but you could definitely whip up a quick side dish to go along with it. Another great this about this recipe? It can be easily scaled down, so say you aren’t cooking for four people, (which I know many of you aren’t), you can easily just halve the amounts of ingredients in here and you’ll have enough for two meals and probably a few extra veggies. 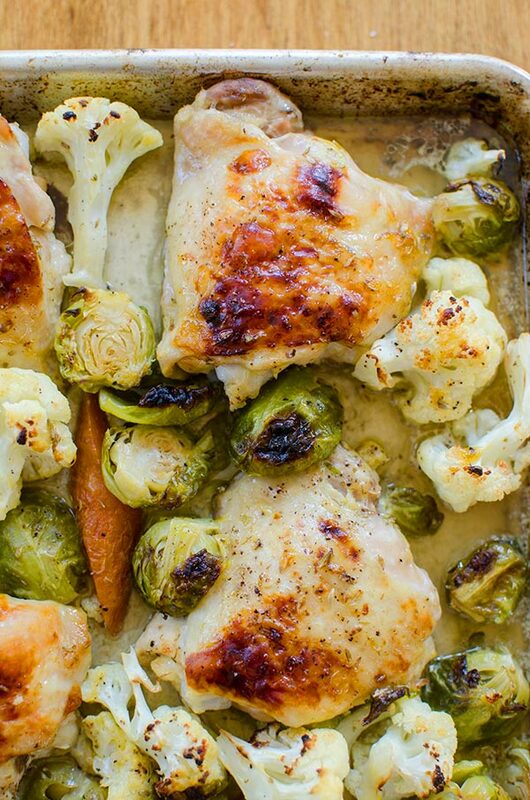 One-pan chicken with cauliflower, brussels sprouts and carrots will be one of the best one pan meals you'll ever make with tender and juicy chicken flavoured with Dijon, honey, lemon and thyme. 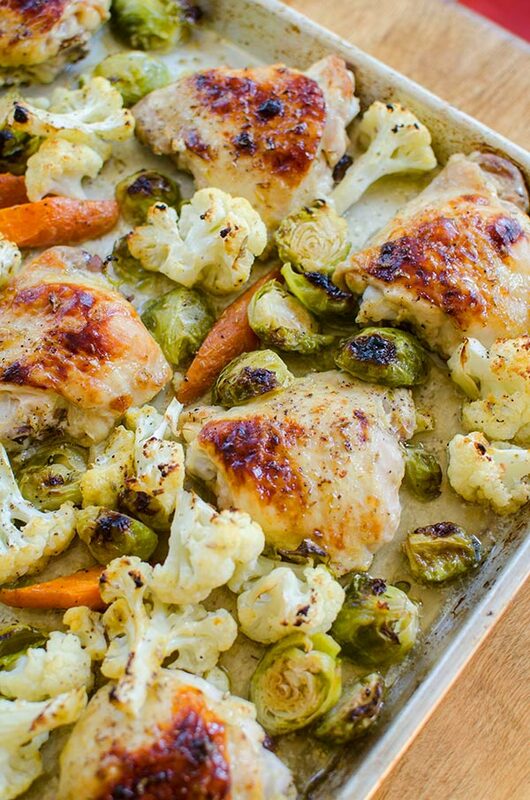 In a large baking pan, arrange vegetables in one layer and nestle chicken in between. In a small bowl, whisk olive oil with Dijon, lemon juice honey, thyme and salt. Drizzle mixture all over vegetables and chicken, use a spatula or your hands to make sure everything has been covered. If chicken hasn't browned enough, turn on the broiler and broil for 2-3 minutes, watching carefully to avoid burning. 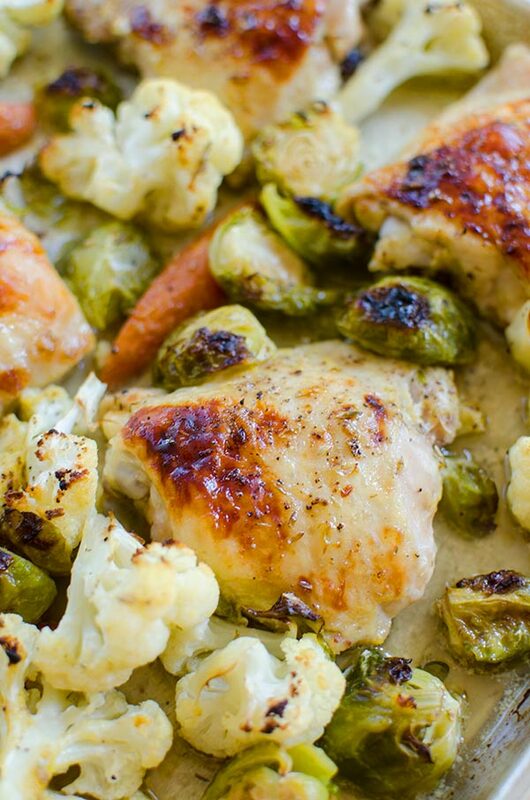 Let me know if you give this one-pan chicken with cauliflower, brussels sprouts and carrots a try in the comments below. Thanks Mithra! Let me know if you give it a try. Yummmyy and Looks delicious..I loved this recipe ! Oh my goodness! This looks soooo delicious, nutritious & simple to make! I am going to definitely make this recipe! Can boneless /skinless chicken be used? Hi Loretta, yes chicken breasts will work! Just be sure they cook until they reach 170F. Would the cooking time be the same if you used chicken breast? Hi Martha, yes the cooking time should be the same. I made this tonite! So easy and hearty! Perfect weeknight meal. My boyfriend said it was the best dish I've ever made. The olive oil mixture was sooo good. Only variation I added fresh garlic. This dish will be on repeat in our house. Yum! is it okay if i use honey mustard instead of honey and dijon mustard separately? This was so good. Baked for about 40 min. Nothing burnt either ( I was worried about the honey). I am adding this to my favorite and easy recipes. Thanks for sharing. I tried it and it was delicious. About to go make it for dinner now! So glad that you like this Jaime! :) Thank you for letting me know! I'm so glad you enjoyed this Mischelle and love hearing the adaptations you made--that's the best part about cooking! Made this tonight, and it was delicious! As promised, it was quick & easy to prepare, and yielded delicious results! Enough leftovers for dinner for 2 again tomorrow. So glad that you enjoyed this Becky, it's one of my favourites! Why is the print so incredibly light? So incredibly hard to read. I don’t understand the reason why it has to be so late is you’re not saving any ink.